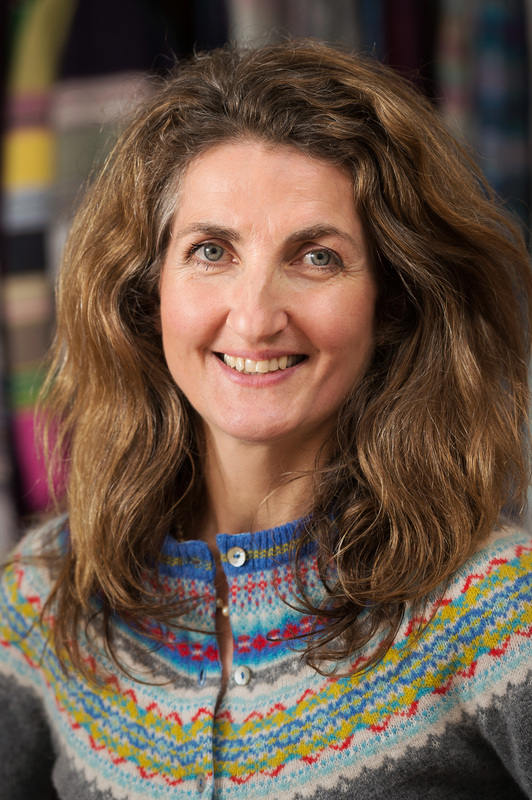 Keeping it real is what really matters to Eribé Knitwear founder and Managing Director, Rosemary Eribé. 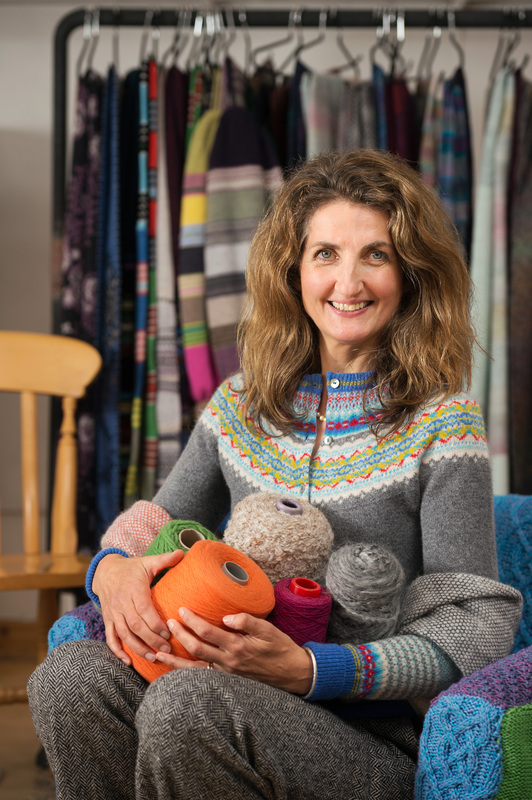 With nearly three decades of entrepreneurial acumen already under her belt, Rosemary has built a stunningly successful designer knitwear company into a global brand, right from her base in Galashiels. What’s more, she’s stuck fast to her creative vision along every step of that long business journey. Being one of a team, developing ideas together, sharing group skills, and ethical working all play their part in Rosemary’s business ambitions. Bonding and building relationships with hand-knitters, staff, suppliers and clients alike keeps her entrepreneurial ethos intact, and with her contemporary, colour-infused patterns and designs, Rosemary’s keeping the Borders’ textile heritage alive, and knitting. But there’s no spinning of yarns from this globally successful Galashiels entrepreneur – in fact, a business career was not even on the Eribé agenda back in the day. Rosemary always knew she wouldn’t be following in the academic and intellectual footsteps laid down by her family, but further education always was on her cards. Some sound sibling advice not to rush in to college or uni took her to Germany on an apprenticeship in retail management. From there a fledgling interest in textiles took hold, but being imprisoned behind a counter certainly did not ignite Rosemary’s creative spark. Those sparks only started fizzing when Rosemary’s father found a textiles design course at the Scottish College of Textiles in Galashiels – and her future was then dyed in the wool. Rosemary’s natural flair for working with yarn soon came to the fore, and she knew early on that setting up on her own was the right route to follow. Studies were completed at the same time as raising a child on her own, and despite the real challenges of living on a very low income, Rosemary’s creative enterprise ambitions remained solid. After graduating in style with a First, 1986 saw Eribé Knitwear emerge. It was tough going at first, with the fledgling knitwear business supported on nothing but a weekly enterprise grant of £40, and the first start-up sales. Like many others in craft and design, Rosemary began business alone, working at the kitchen table, but she always looked beyond her backyard, and used travel and learning to develop ideas, planning and products. Using Scotland’s rich heritage in the form of fine textiles was a winner in wool, and Rosemary was one of the first to see the potential for historical context and culture as a formula for commercial success. This international concord has provided two-way trade for Rosemary – overseas influences have helped shape her approach to business, and guided her distinctive leadership style. Even now, nearly 30 years on, as managing director of a limited company with a staff of 13, and over 240 artisan hand-knitters on the books, Rosemary prefers collective input over autocratic rule. In person, Rosemary embodies the creative part of her vision – she’s vivacious, warm, original and ever-so stylish, just like her beautiful Galashiels garments. She’s a creative powerhouse with an infectious energy for business, and a firm belief in nurturing new talent, mixing up youth and experience on her own tight-knit team. Rosemary’s ambitions stretch far beyond borders and balls of wool, and significant growth plans are already being spun. The magic of Eribé Knitwear might be created in a corner of the Scottish Borders, but its success is wrapped right round the world, in vibrant colours and stunning designs. Thinking trans-global has led to a client base that’s strung around the world, in countries as diverse as Japan, Germany and the USA. 200 customers in 17 countries testify that Rosemary’s business sensibility is the real deal, and not at all woolly.